Sven Začek - Is there someone? 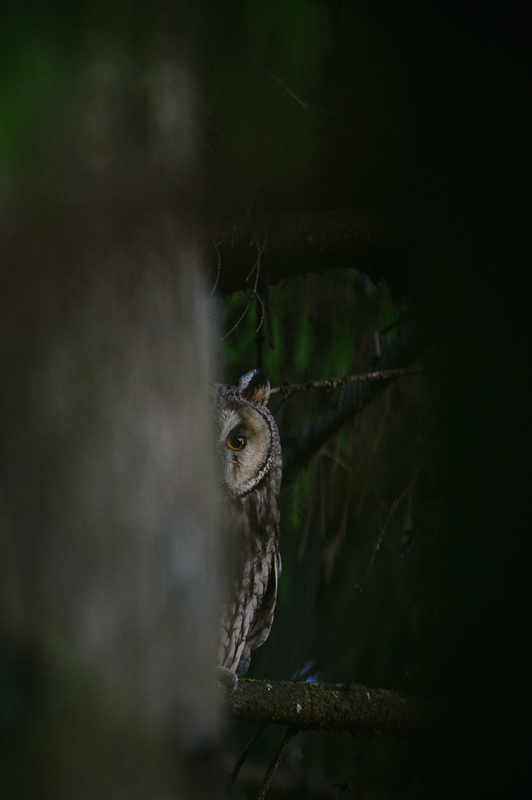 This type of shot has been my long time goal with long-eared owls. Not for the usual reasons that wildlife photographers have to pursue a species, but because this type of shot has been practiced a lot in the UK by bird renting photographers. I remember seeing pictures in BBC Wildlife some time ago, where in one issue there was a long-eared owl peeking from behind a treetrunk and then in the next issue there was a photo from the same setting, but the model was now a goshawk. Quick search on the internet revealed the truth. Ever since I have been trying to make a similar picture in the wild, but even better. And I think I succeeded here with little help from the old spruce trees that created a nice mood. A marvellous shot Sven ! Sven, I know exactly which shot you're referring to... Hats off to yours, pure and wild as we like it! I am sure you do Bruno, because I know that your are also only for pure nature photography and always keeping an eye on such things. Thank you!